I wanted to share this woodworking article with you…. 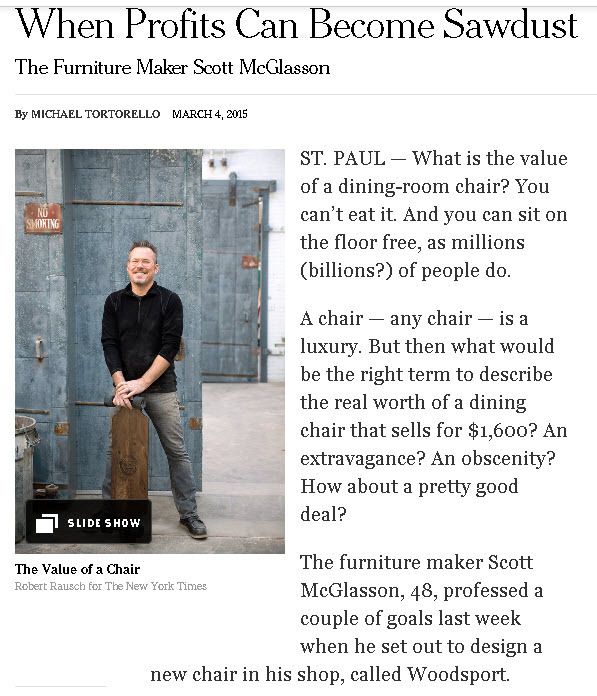 As I sat for my morning coffee this Sunday I found a great article in the New York Times (March 4. 2015). As I read it I thought the author must be or was a woodworker. He caught the essence of a project so well and described it with great clarity. Can you relate to this woodworking story? I think it captures a lot of the reality. Maybe I am biased, but the article seemed a bit — negative. I like the images of his work and his descriptions of his process – both mental and physical. We share or feelings about those Festool prices and capabilities for sure. Contrary to the tools information the article takes us back to hand tools. One section quotes Peter Korn [Center for Furniture Craftsmanship] on using hand them. And here are are – paraphrasing the article – beer thirty is approaching. time to post this piece. If you find an interesting article or post about woodworking of related subjects, please pass in on to me. I’ll share it if I can. It’s always good to hear another opinion or point of view. Many of the product improvements and some features come from user comments. So you can be sure we read and listen. Please feel free to chip in your advice, comments, or opinions.